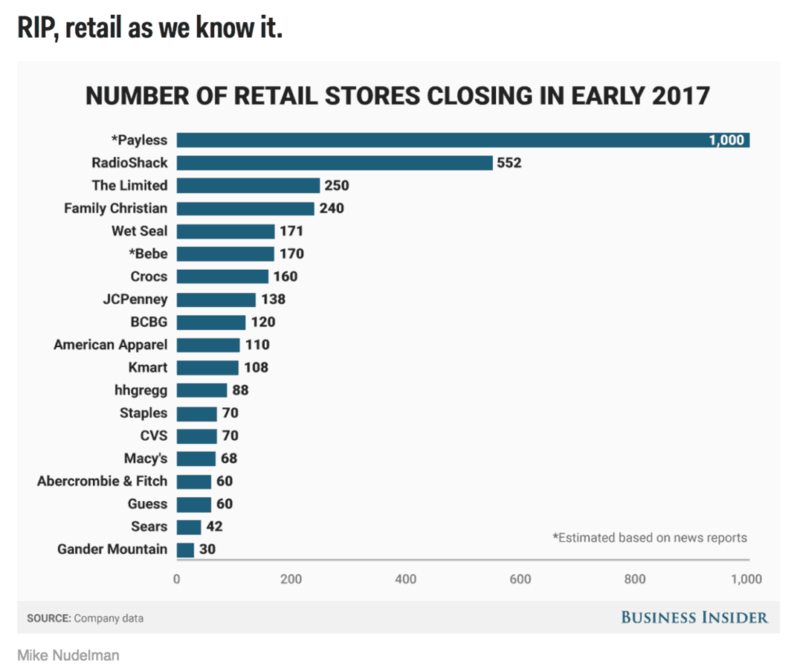 Retail closings according to Business Insider. Add that to what you see at the big trade shows in our industry. We see the rise of DTG and the rise of transfers. Does it mean the end of screenprinting? No way. 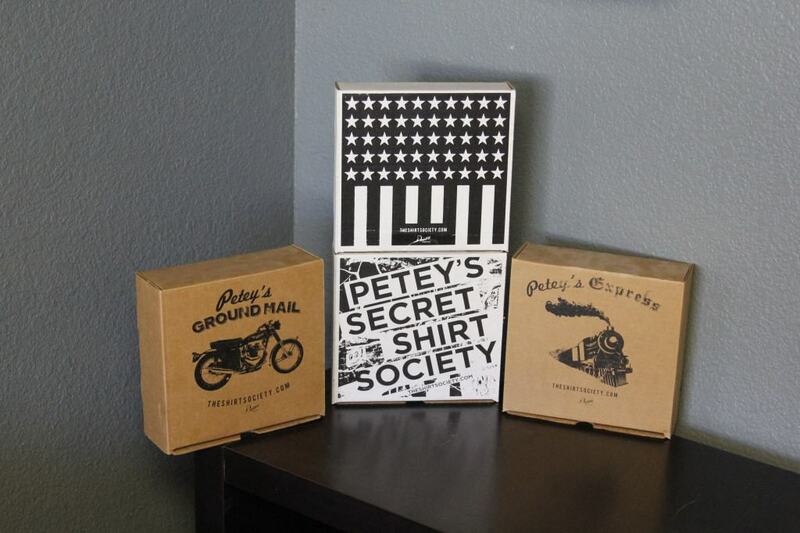 Shirts going out, one at a time, something you will see more and more of. More and more shirts will be bought one at a time, delivered in a bag by UPS or Amazon themselves but the question is how will they get printed and how will they get into that bag. Those shirts will be decorated in a variety of ways. Digital printers will print one at a time, but almost as quickly folks will press a transfer on to a shirt and send it out the door. 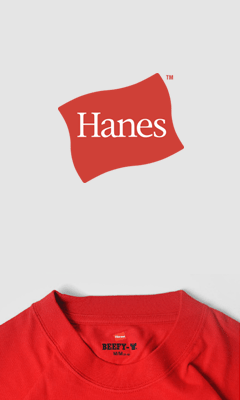 The lowest cost sometimes will be a mass printing of shirts that might even already be in a bag ready to send. Yes, when you pick a winner or if you are in the early stages of catching a wave, then printing up inventory is definitely still the fastest and cheapest way to go, but that still leaves lots of occasions where it is not. DTG: I see us at the early stage of this, where just to be able to print one at a time somewhat cost effectively is a license to make money. The machines are expensive and/or the ink is expensive and honestly I see hardly anyone that consistently gets great results, the machines only work for folks that don’t much care about the quality. 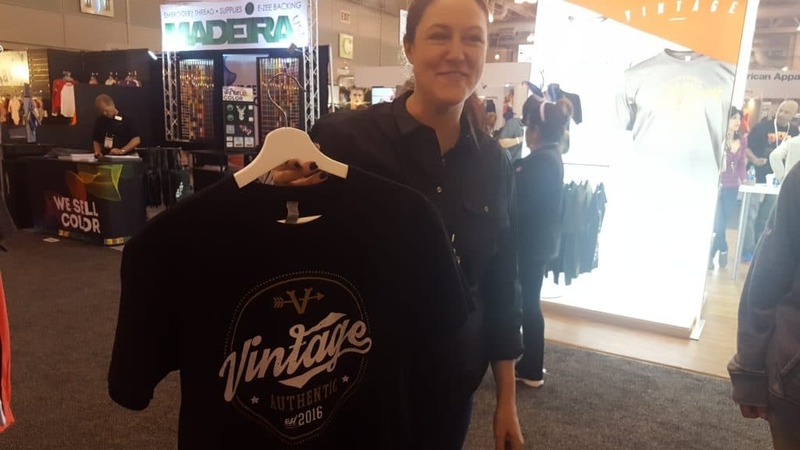 Nevertheless, businesses I have talked to planned on printing up to 24 pieces digitally and screenprinting anything with more shirts than that and then they find actually that it turns out DTG is more efficient up to 50 or even 100 shirts. Real life screenprinting when you take off your rose colored glasses is pretty damn slow. Some shops run like clockwork, but most aspire to and then don’t, so DTG increasingly makes more sense. TRANSFERS: The transfer industry is blowing up and I think they are just getting started. Folks involved with making or applying transfers are some of the only businesses I see on the upswing right now. More and more it looks as good as a direct print (or better in some cases) and it allows for more flexibility on what shirt you apply it to right before it goes out the door. If you print up 200 transfers and sell only 100 it is not nearly the problem you had if you made 200 shirts, in terms of cost, momentum, choosing the wrong size scale, etc. Carrie Terwilliger of F&M showing one of their many transfers which look as good if not better than direct screenprints. 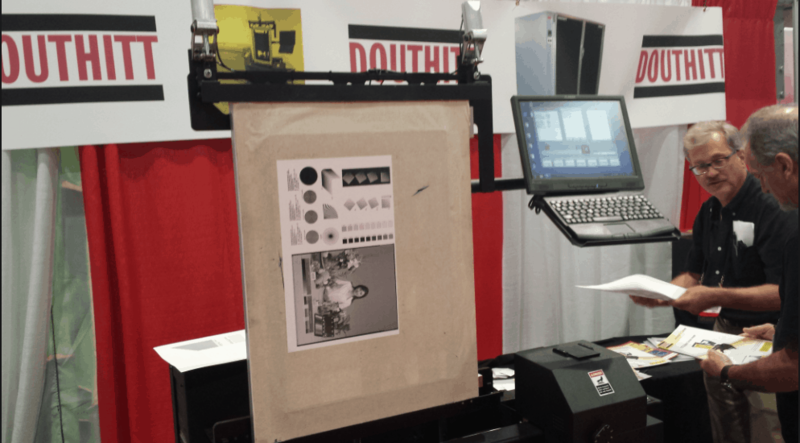 SCREENPRINTING: Screenprinting is not dead and in some ways it is better than ever. Quality and speed of set-up are improving. 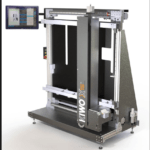 Direct to screen and improved presses account for most of the advances we see. 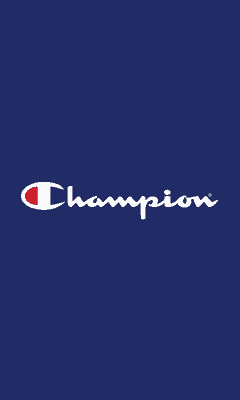 It is the fastest way to produce printed garments and still allows for great creativity. 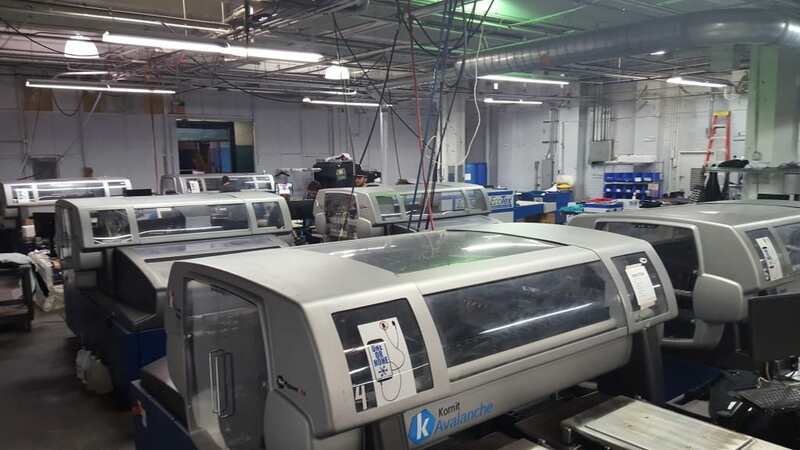 Direct to Screen (DTS) units like the ones from Douthitt and KIWO are making screenprinting operations more efficient. Successful businesses will be using all these techniques. 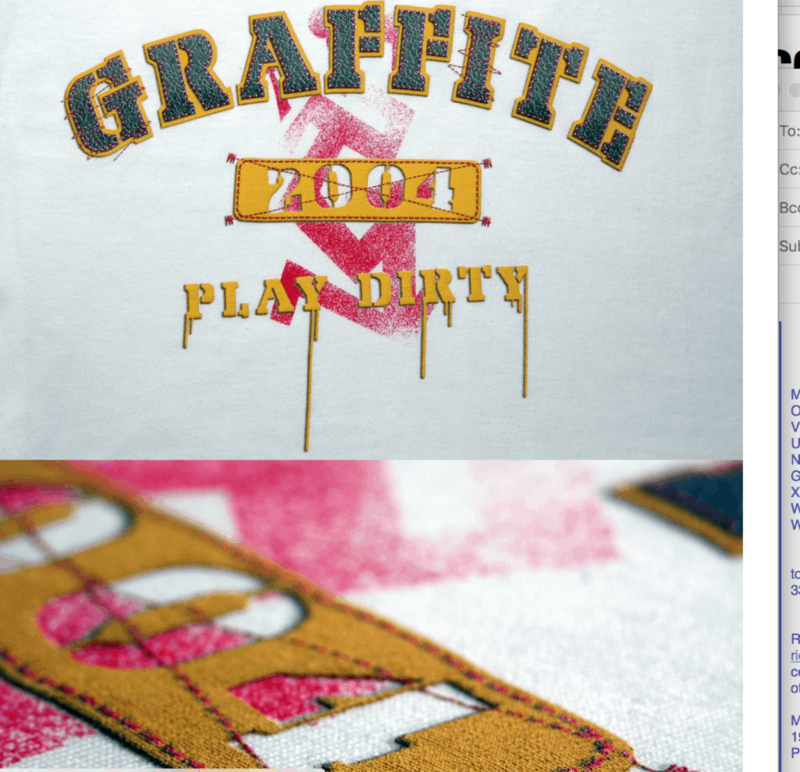 Folks might even start figuring out how to use DTG and it will be a better adjunct to screenprinting. Transfers will be seen for the serious option they currently are, and not a thick cracked peeling Care Bears or Farrah Fawcett shirt with a border around it that we still imagine. The next investments we see will be in workflow. Successful business owners I meet at these shows have invested front end and also back end in their on-line customer interface. You can’t talk to a person who wants one shirt or even 50 shirts and make any money. You can’t make money if you struggle to find the shirt that design number 1,679 goes on and what size bag it goes out in and to what address. And last but not least I see a movement to actually appreciate design. All the brainpower in the world attending to how to get a design on to a shirt and then to your door efficiently doesn’t matter if the shirt is ugly. If you actually design with the decoration technique in mind, you get better results and not just aesthetically, but also in terms of printing results. No matter how you sling the ink on to a garment it has to take into consideration the garment, how you print it, and design. Yeah, design matters.